The family-owned business is sewn into the fabric of Northern Kentucky, but working with relatives is not always easy. 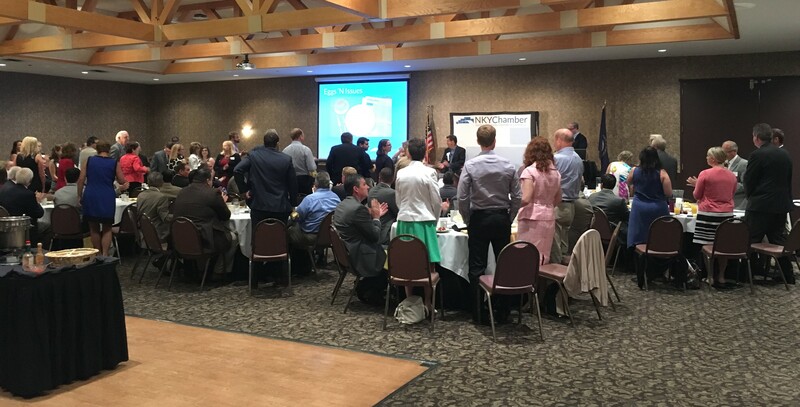 At the monthly Northern Kentucky Chamber of Commerce Eggs ‘N Issues at Receptions in Erlanger Tuesday, some local business leaders talked about how they have managed to smooth out some of the bumps. Eric Haas of National Band & Tag and Deborah Simpson of Multi-Craft talk about the benefits and challenges of running a family-owned business (photos by Mark Hansel). 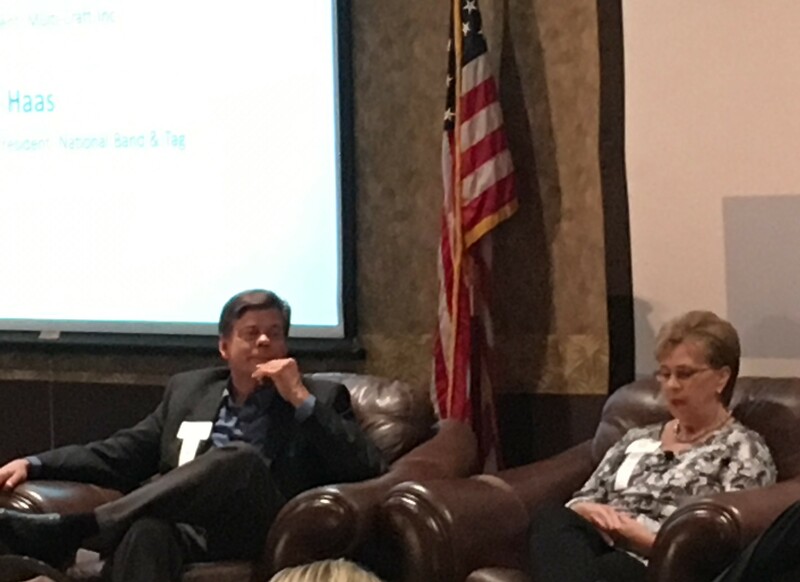 Eric Haas of National Band & Tag, and Deborah Simpson of Multi-Craft, joined Larry Grypp, president of the Goering Center for Family & Private Business, for a candid discussion on the topic. In the United States, there are 5.5 million family businesses that are responsible for $8.3 trillion of gross domestic product (GDP), according to the Goering Center. They make up 63 percent of the workforce and are responsible for 78 percent of all new job creation. The number of successful family-owned business in Northern Kentucky was brought into focus when those who were employed by such a company were asked to stand Tuesday. Less than half of those in attendance remained in their seats. Grypp said family business generally begin with an owner founder, and if successful, moves on to a sibling partnership. If the success continues, the next stage of progression is a cousins consortium. National Band & Tag, was established in 1902 and has pretty much followed the stages of progression Grypp described. There are now 11 family members employed in the fifth generation company. The impact of family-owned businesses in Northern Kentucky when those who worked for such a company were asked to stand at Tuesday’s Eggs “N Issues. Only a scant few remained seated. Haas, who is also a cofounder of Newport’s Hofbrauhaus and the Fort Thomas mayor, has stepped down as president of National Band & Tag, which employs about 65 people. He now serves as a consultant. Simpson’s father started Multi-Craft with a partner in the basement of the family home. That changed in 1969 when her father moved the company out of the house, bought his partner out and the company receptionist quit. Simpson had always dreamed of being in business which, at that time, meant becoming a secretary and not much more than that. “I looked at it as a golden opportunity and went to work and fell in love with the business,” Simpson said. She worked at different jobs throughout the company and became its president in 1990. While both companies are family-owned they serve very different customers and their approach to business is consistent with the stage of family participation they operate in. Haas has reached the cousins stage and beyond, while Simpson is still in the sibling phase. Simpson owns a third of Multi-Craft, as do a brother and a sister. Simpson can recall only one time when the three did not agree on a direction and she was outvoted. Haas said he can make decisions in that way with his sister but it’s “a whole different ballgame” when it gets to the cousin level. Getting 11 people to agree on even the simplest task can be challenging, but when it comes to making decisions that ensure the continued success of a century-old business, it’s nearly impossible. Haas credits the Goering Center with teaching the group to make decisions that were in the best interests of the company, which will ultimately benefit the family. The family partners developed a notebook of policies that helped determine how decisions were made. Using outside consultants, that developed into the company charter. The companies also differ in hiring policies for family members. Simpson said Multi-Craft, which now has 47 total employees, will always make room for family members. That doesn’t mean relatives get a free ride on the family coattails. “For us, if you want in, as long as you are qualified to do what you want to do, the pay is whatever the position pays and there are no added benefits,” Simpson said. National Band & Tag previously employed a similar philosophy, but as the family has expanded, things have changed. Stock is more of a company asset than a benefit of ownership for family members in both companies. At Multi-Craft, a family member must be working at the company to hold on to stock. If they leave the company, retire, or become disabled, they must sell the stock back to the company. “If you’re not there every day, we don’t believe it’s fair that you have a say in it,” Simpson said. National Band & Tag requires all stock to be gifted to the next generation upon retirement or separation. Haas and Simpson agree that the goal must be to continue the legacy for both the family and the employees.